AllTrac.net • View topic - upgrading wta intercooler? i like that idea of moving the core, i also thought of the same i've also been looking into the biggest heat exchanger i can fit in front of the a/c condenser area on a st165 i was looking at a radiator with horizontal flow but its hard to find one that really fits. "straight lines r 4 fast cars, turns r 4 fast drivers" Colin McRae. ST185, black: current project, "The Kraken"
the 205 pump is WAY bigger than the 165 pump. Which I don't mind at all, I wanted a more effective system anyway. However, the inlet/outlet do not line up, and lines are way bigger on the 205 pump. The inlet/outlet on the 165 pump are about 5/8", maybe closer to 11/16" (I measured about 17mm) and the lines for the 205 pump are about 7/8" (about 21-22mm). This poses a problem since I was hoping it would just line up. has anyone else done this upgrade? I would like to know what they did to get it in there without ripping the whole system out and replacing everything. i would get the whole setup, and you don't have to use the hardlines at all if you want you can use longer sections of hose to hook it all up. built2run wrote: i would get the whole setup, and you don't have to use the hardlines at all if you want you can use longer sections of hose to hook it all up. +1 to that...it makes installation so much easier, plus you can be alot more flexable where you run your pipes...a few lengths of the flexable samco pipe and you`ll be sorted. 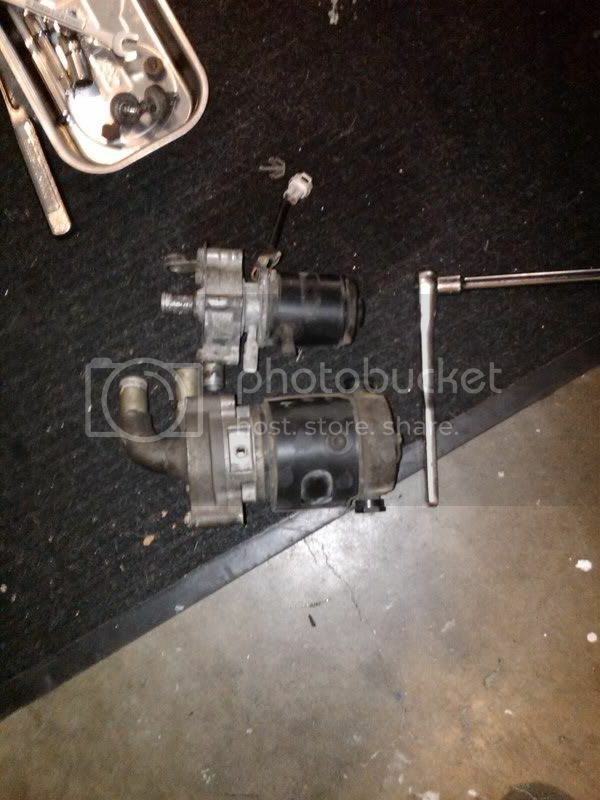 Does anyone know if Toyota makes a rebuild kit for this pump? My st205 IC pump sounds dead and is making some brutal squeaking sounds when it warms up. I saw that johndgt4 said they can be rebuilt. Would this be in the BGB or on any site you can think of? I suppose, being in Canada, I'll need to order any rebuild parts from the UK or Japan seeing they never made the ST205 here at all, and they didn't use that pump on any other car. Depending on costs, it might just be easier to find another used. Toyota doesn't make a kit. You have to source the seals and bearings yourself. the lines are indeed 7/8. when i had my wta setup on my car i had the same pump. i ended up using 3/4 in lines with a bit of vasoline and violence, and that worked just fine. the only bracket necessary was the bottom one... otherwise lines all the way work quite well. ATSAaron wrote: You specifically told Matt that "some kid dumped sand into my motor." don't let some kid dump sand into your motor. Does anyone have in line flow rates for any of the gtfour intercooler pumps? Not only is the 205 intercooler bigger than the previous ones, but the pump is too. It is about double the size of the 165 pump, larger diameter hoses as well. The pump is as big as a washing machine pump lol. A company in China called GPI Racing make a heat exchange aluminium radiator for the 205 and MR2. They are on the web if you want to look at it. Thanks for the tip about the insulation felt. The larger reservoir is a good idea as well, locate it somewhere away from the engine heat. Also I am thinking of installing thermostat switch somewhere so my ECU can control the pump operation. I live in Australia where the summers are hot. (very hot up to 40c). The air in the day is dry hot so I don't thing an air to air type intercooler is suitable. Therefore I for one will be sticking with WTA system. Maybe I will put a fan in front of the HE.